It's hard to believe it's been only two and a half years since a hand-held Zelda title debuted. Maybe it's because the DS has long since asserted itself as the de rigeur Nintendophile hardware, lending an air of obsolescence to the Game Boy Advance's The Minish Cap. Or maybe it's because the latest console Zelda release, Twilight Princess, made its debut as launch title. Either way, the DS' The Legend of Zelda: Phantom Hourglass feels like it has been a long time coming. In many respects, Phantom Hourglass plays like a streamlined version of The Wind Waker. It features a similar blend of oceanic navigation, overland adventuring and dungeon exploring, but the story moves much more swiftly from one location to the next. With the exception of one slightly aggravating temple to which Link must repeatedly return in order to accomplish timed objectives, even the dungeons are expedited affairs that can be easily completed within a half hour or so. Phantom Hourglass story equips Link with new items and abilities at a swift, steady pace, and for better or worse, there are less opportunities for obsessive item collecting and errand running than in most Zelda games. Key Zelda story elements are present, of course, including a central female character to rescue and an ancient evil to defeat, but apart from some basic treasure hunting and exploring, there aren't many optional side quests to pursue. Although Phantom Hourglass content feels a bit trimmed down (at least in comparison to your average Zelda game), the game has charm and style to spare. Its characters are funny and engaging, and its vibrant, detailed environments are gorgeous. Technically speaking, you could hardly expect better from the DS. 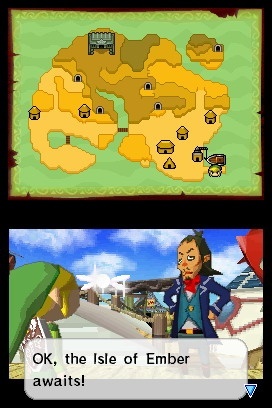 Although rendered almost entirely in 3-D, most of the game takes place from a top-down perspective reminiscent of vintage 2-D Zelda titles. 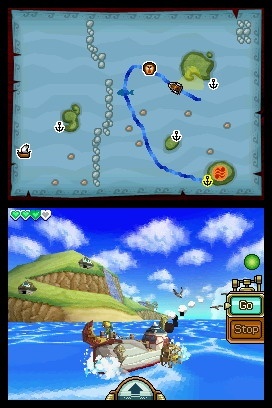 The nautical portions, in contrast, are entirely 3-D and allow the player to swing the camera around for a 360-degree view of the sea. They're reminiscent of The Wind Waker's sailing scenes, but this time Link charters a customizable pirate steamship, and he's no longer dependent upon ocean breezes.